States burdened with conflict have been considered to be undesirable destinations for foreign direct investment (FDI) due to, inter alia, political instability, regulatory unpredictability, and expropriation risk. However, we develop an alternative view based on corporate governance and real option theories. We analyze a dataset of FDI location decisions made in the Oil and Gas sector by 250 US firms across 44 countries between 2007 and 2013. After controlling for energy reserves, the results show counter-intuitively, that civil war and terrorism risks, and terrorist events are positively associated with US investment in Oil and Gas. US subsidiaries also show high levels of ownership commitment. It is tempting to conclude that US Oil and Gas is a wholly unique, resource-bound case, but we argue that this disconnect may have occurred for two reasons. First, a threat of conflict and violence can make MNEs exercise their growth options and expand resource extraction sooner rather than later. Second, political instability does not necessarily lead to higher levels of FDI expropriation risk. On the contrary, instability can reduce the incentives for the state to seize assets from technologically superior MNEs, i.e. it may reduce expropriation risk. Just as the rule of law and ‘good’ governance can constrain a state from expropriation, there are theoretical reasons why ‘bad’ governance resulting from instability and incapacity may do so, too. Countries characterized by extreme forms of political risk and conflict—including political violence, intra and inter-state war, and terrorism—are generally considered to be undesirable destinations for foreign direct investment (FDI) (Busse and Hefeker 2007; Driffield et al. 2013). This is attributed to potential losses associated inter alia with political instability, regulatory unpredictability, and expropriation risk (e.g., Holburn and Zelner 2010; Jensen 2003). More recent studies, however, point towards a degree of sectoral heterogeneity in the response of FDI to conflict: in particular, the relative insensitivity of resource-seeking FDI to political conflict (Witte et al. 2017). Furthermore, Biglaiser and DeRouen (2007) reported findings that seem counter-intuitive, with societal conflict found to have a significantly positive influence on general FDI inflows. This paper addresses important research questions, as follows. In general, how does a host country’s political instability and conflict influence inward FDI and its ownership commitment? Can theory explain any sectoral heterogeneity in FDI responses to instability? Is FDI by resource-seeking firms attracted to nations with societal conflict, and if so, can this effect be fully explained by the availability of the resource? Answers to these questions would respond to a recent plea for further contextualization of the conflict/FDI relationship (Bailey 2018). This paper addresses these research questions in the context of the US Oil and Gas industry. It begins with a review of the relationship between general country and conflict risks and inward FDI in theory and practice in general across all industries, and then for resource-seeking firms in particular. This is followed by an analysis of ownership mode and foreign entry. A ‘Methods’ section explains our choice of US Oil and Gas as a focal industry, and subsequent sections follow the usual sequence of results, discussion and conclusions for theory, practitioners and policy. Dunning’s eclectic OLI internationalization paradigm still dominates IB thinking regarding influences on the destination of FDI. Recent comprehensive reviews include Nielsen et al. (2017) and Bailey (2018). FDI is expected to flow to any location that offers the MNE a suitable combination of OLI advantages. Here, (O-) ownership-advantages “refer to a firm’s tangible and intangible resources […] that a firm may exploit internationally” (Nielsen et al. 2017, p. 65). On the other hand, (L-) location advantages include lower production costs and favorable institutional and political environments (which may be modified by conflict risks). (I-) internalization advantages are rooted in transactions-cost analysis (TCA) which identifies behavioral downside risks, involving technological spillovers and brand protection, and favoring operations within the firm to market transactions, e.g. licensing to host country incumbents. When all three OLI advantages favor direct investment, inward FDI is predicted. This prediction is strongly supported by a raft of empirical studies. For example, political stability, democracy, and rule of law (Bailey 2018), together with well-developed formal political and legal institutions, attract inward FDI (Nielsen et al. 2017). An institutional environment conducive to ‘good’ corporate governance attracts foreign investments (Biglaiser and DeRouen 2007). The presence of these strong institutions in the host country supports market exchange (Ahsan and Musteen 2011). It follows that negative influences, institutional voids (Khanna and Palepu 2005) and high country risks in general should have adverse consequences for inward FDI via L-advantages. This is confirmed by the meta-study of Bailey (2018), by Driffield et al. (2016), and by Goswami and Haider (2014); who find FDI was discouraged by such factors as corruption, tax rates and cultural distance. However, slightly different conclusions apply to one specific category of country risk—violent political conflict. This ranges from the risks of civil war and terrorism, and terrorism events, to war between nations: all studied below in relation to US Oil and Gas. Consistent with OLI theory, decades of research (Chen 2017; Dai et al. 2013; Li and Vashchilko 2010; Nigh 1985) have associated political violence negatively with overall inward FDI. Mancuso et al. (2010, p. 787) report “a general consensus in the literature that increases in terrorist activity or risk reduce the inflow of FDI”. However, while Witte et al. (2017) support this ‘general consensus’ overall, they note the insensitivity of resource-related FDI to political conflict. This they attribute to the high profitability of natural-resource extraction and to the geographic constraints on location choice. As noted above, Biglaiser and DeRouen (2007) report a positive, counter-intuitive relation between societal conflict and FDI for fifteen Latin American countries, 1980–1996. This they attribute to natural resource discoveries in Colombia, Mexico, and Peru. Resource-based firms and industries as possible exceptions in relation to political conflict and FDI raise a new possibility. Rather than being attracted only to countries offering ‘good’ governance, resource-extractive firms may have developed capabilities that enable them to survive and thrive in hostile, ‘bad’ governance environments (Frynas and Mellahi 2003). This ‘bad’ governance hypothesis can be explained by real options and corporate governance theories. OLI theory views country risk negatively as a cost and deterrent to FDI that can be reduced overall by international diversification (Chung et al. 2013). In contrast, a real option approach1 emphasizes the valuable “sequential flexibility with which a productive resource or asset can be designed, acquired, utilized, improved or scrapped” (Driouchi and Bennett 2011, p. 206). Firms can use this flexibility strategically to limit downside risk and exploit emerging upside potential under uncertainty. The upside potential in the form of opportunities for international entrepreneurship may indeed be significant in unstable and risky countries that are characterized by market dislocations and disequilibria (Di Gregorio 2005). In this respect, a real option perspective accords with the literature on entrepreneurship which views risks as two-sided opportunities. Consequently, Trigeorgis and Reuer (2017) identify five types of real option: options to defer (or stage), grow, change scale, switch or abandon. In particular, growth options are created at market entry and facilitate “enlarging a new foreign subsidiary by subsequent investment” (Fisch 2011, p. 517). It is argued below that growth options have the greatest significance for resource-seeking firms. Oil supply is often flexible upwards and downwards, often depending on the resource’s price. Unlike other industries where downsizing is costly, however, reduced resource extraction often leaves resources ‘in the ground’. These assets may even increase in value when left alone. It is difficult to judge the value of these unrecovered minerals and energy resources, since most national accounting conventions for extractive firms exclude from balance sheets the potential value of resources acquired by subsidiaries until they are extracted or processed (e.g., Securities and Exchange Commission 2010). Nevertheless, in the USA the SEC does require Oil and Gas companies to disclose the volume of their reserves in supplementary documents, suggesting that unrecovered reserves represent valuable assets for oil and gas firms. For example, the annual report of the USA’s biggest oil and gas company, ExxonMobil, shows that in 2017 it possessed proven Oil and Gas reserves representing 21 billion barrels of oil equivalent. Disregarding the costs of extraction for this rough estimate, these barrels valued at over US$73 would imply a total value of reserves of $1,533,000 million. These reserves dwarf ExxonMobil’s total book assets, worth ‘only’ $348,691 million in 2017. Regardless of accounting conventions, regardless of the current market conditions and the current levels of oil price, unrecovered reserves could be extremely valuable to most extractive firms as they convey the opportunity to undertake positive net present value projects in the future. From a real option perspective, the acquisition of reserves by resource-seeking MNEs is more likely to confer growth options and pre-emptive, first-mover options on subsidiaries, thus increasing the value of investments beyond any values obtained through classical investment appraisal (e.g. Discounted Cash Flow) methods. Of course, the above ground assets (e.g. facilities engaged in drilling, transferring and refining oil) of resource-based foreign subsidiaries could be vulnerable to terrorist attacks and destruction, but the most valuable assets may be non-lootable, and safely deep underground. Nevertheless, specialist articles on the security of Oil and Gas assets are mainly focused on threats to above-ground assets (c.f. Bajpai and Gupta 2007). Underground assets may continue to appreciate in value even after surface installations have been attacked or destroyed. In other words, downside risks may be limited in extractive industries, and upside risks with positive real option values may be more important than negative pull-out risks, thus encouraging inward FDI, despite political conflict. Of course, expropriation (rather than the destruction of assets) may still be a major risk where predatory states prevail, but non-lootability may again prove to be important. To the extent that political conflict and violence reduce the capacity of state-controlled domestic firms to operate expropriated assets and businesses, the incentives of the state to expropriate technologically superior FDI could be lower and FDI could be higher under conflict. We predict that this effect to be more relevant for non-lootable or ‘defendable’ resources, while investments in the country’s endowment of lootable natural resources remain vulnerable, likely to be negatively affected by conflict. Lootable resources are those that can be exploited relatively inexpensively for profit, usually on a black market. For example, rebels have financed their efforts by selling alluvial diamonds found in riverbeds and shorelines that can be relatively easily collected with basic equipment and sold as contraband (Lujala et al. 2005). These gems are particularly lootable owing to their high value-to-weight ratio that makes them easier to smuggle. Contrast this with other natural resources, e.g. minerals and Oil and Gas. Extracting oil is capital and technology-intensive and it can be highly localized with facilities surrounded by high walls, or perhaps open sea (Frynas 1998; Rhuks 2012). Above ground petroleum facilities are vulnerable but may be protected by networks of private and state operators and private armies. For example, Hirsch and Vidal (2012) reported leaked internal Shell Nigeria documents showing $383 million spent on security (40% of Shell’s entire security budget) in Nigeria over three years. This included a ‘1200-strong internal police force’ plus a ‘network of plainclothes informants’. A third of this was spent on third parties, including the services of 600 Nigerian police, and 700 members of a ‘joint task force’ comprised of army, navy and police. Even if the impressive military power of companies such as Shell were to be overcome by state or non-state actors, after expropriation, a state (or rebel group) with limited capability is unlikely to be able to run highly complex facilities, particularly those involving exploration. Whenever expropriation in the oil and gas sector has happened in recent decades it has typically been in states with moderate levels of state capacity, management skills and development, e.g. Iran (1951) and Venezuela (1976 and 2007), see Mahdavi (2014). Hypothesis H1: Inward FDI presence in resource-extractive industries is positively associated with a host country’s levels of political risk and violence. It will be explained in ‘Methods’ section why US oil and gas FDI was chosen to test H1. Besides the presence of FDI, one of our research questions asks how does a host country’s political instability and conflict influence the degree of foreign ownership of MNE subsidiaries? To address this question, we need to consider again briefly the theoretical predictions of traditional entry mode theory and of real options theory. Traditional entry mode theory, like much of OLI theory, is mainly based on Oliver Williamson’s Transactions Cost Analysis (TCA), but is focused primarily on the internal, negative behavioral uncertainties of market transactions (e.g. contractual opportunism and ‘hostage-taking’) rather than on exogenous uncertainties like political conflict in a host country (Ahsan and Musteen 2011). However, some studies have extended the entry mode approach to embrace institutional uncertainties through their impact on behavioral uncertainty. According to TCA, MNEs encountering high levels of uncertainty are predicted to prefer high commitment/high-control vertical integration to reliance on markets or more market-like entry modes (c.f. Brouthers 2002; Meyer et al. 2009). In contrast, in host countries with strong institutions that encourage low-commitment market exchange, MNEs can rely on their host-country partners (Ahsan and Musteen 2011). By implication, high levels of exogenous uncertainty (e.g. political conflict) and weak institutions are likely to invite high levels of ownership commitment and vertical integration. The discussion of FDI presence in the previous section suggests that real option theory generates propositions for resource-extractive firms that contradict those from TCA-based internationalization theory. Real option theory proposes that FDI in extractive industries may increase where environmental uncertainties are high. In the case of entry ownership modes, however, a real options approach reinforces traditional, TCA predictions, i.e. each theoretical perspective predicts higher commitment levels under high uncertainties. We are convinced by the logic of Li and Rugman (2007), and suggest that resource-extractive firms are likely to be confronted by growth, rather than deferment, options. Growth options imply higher ownership commitments under greater local exogenous uncertainties. Li and Rugman (2007, p. 691) recognize “the value of growth options […] where a high level of uncertainty may not discourage firms from strong commitment to a market”. Hypothesis H2: MNE ownership in foreign resource-extractive subsidiaries is higher in a host country with high levels of political risk and violence. As with FDI presence and H1, the next section explains our choice of FDI in the US Oil and Gas industry to test H2 in relation to subsidiary ownership. A possible positive association between political instability and inward FDI in extractive industries is a relatively new and under-researched phenomenon. This justifies the selection of the US Oil and Gas industry as our empirical focus, since Oil and Gas installations are technologically demanding and need to be part of a complex supply chain. Both are argued to deter expropriation. The first empirical task of our research strategy is to investigate H1 and H2 in the most propitious of circumstances and industries favoring these hypotheses and then subsequently to extend the analysis to other extractive, resource-seeking industries. We restrict the sample of the host countries to the 58 with proven gas or oil reserves as determined by the BP Statistical Review of World Energy (2014), with the USA excluded. Furthermore, and in contrast with previous studies (e.g., Driffield et al. 2013; Witte et al. 2017), we employ regression specifications that explicitly control for country-specific amounts of Oil and Gas resources (Proven Oil/Gas Reserves). The importance of this and other controls is explained in detail in ‘Variables’ section, below. Firm-level data on the value of inward FDI is unavailable without primary surveys, and none have yet been conducted in the EU and USA (Nielsen et al. 2017), though Frynas et al. (2006) do use three narrative case studies that may have limited generalizability. Researchers have therefore had to fall back on country-level studies or use an FDI proxy in the form of increases in the number of foreign firms at a specific location (Nielsen et al. 2017). The latter approach is employed here, though of course this gives no precise indication of the scale of inward FDI. More specifically, following Driffield et al. (2013), we analyze the probability (likelihood) of US firms reporting Oil and Gas subsidiaries in a host country as a proxy for FDI. On the other hand, data on subsidiary ownership is available at a firm level, obtained from the proprietary dataset provided by Bureau van Dijk that identifies foreign firms 2007–2013, directly or indirectly owned by US parents. The sample includes all US Oil and Gas sector firms in the database and also includes those non-Oil and Gas sector US firms that had ownership stakes in at least one foreign Oil and Gas sector subsidiary in any year from 2007 to 2013. This identifies a wide sample of firms potentially interested in the ownership of foreign Oil and Gas subsidiaries. Index \(i\) defines firm/country dyads and \(t\) indexes years. The dependent variable Invest_Oil in the selection (probit) regression (1) equals one if the US firm reports Oil and Gas subsidiaries in the host country in year t and is zero otherwise. The dependent variable Majority_Owned in the ownership (also probit) regression (2) is observed only for the firms that choose to invest and equals one if the firm owns a majority stake (50% or more) in (at least one) of the reported subsidiaries in the host country; and zero otherwise. Explanatory variable sets \(x\) and \(z\) include both country-specific and firm-specific covariates. The choice of explanatory variables is explained in detail in the next section. Control variables also include year dummies that control for worldwide economic fluctuations that give rise to general annual heterogeneity in oil prices and in the Oil and Gas market. One possible approach would be to control for oil price using a price index; but this would potentially miss out on other likely sources of global heterogeneity, such as, for example, the availability of credit and the tightness of financial markets in the wake of the 2008 financial crisis. We therefore use annual year dummies in all specifications to control for unobserved annual heterogeneity that affects markets equally and at the same time. In the rest of this section, we make further points on identification, on the nature of conditional correlation \(\rho\), and on standard errors. Identification: As with identification strategies that are commonly used in closely related Heckman selection models, the identification of the selection mechanism (1) in the bivariate probit model (1)–(2) requires an explanatory variable that appears in selection Eq. (1) but does not appear in the ownership Eq. (2). We propose an identification strategy based on the profit-maximising nature of MNEs as follows. Model (1)–(2) assumes that firms choose optimal ownership types (which might depend on the local institutional environment, political risks and the characteristics and competences of the firm) and invest if the benefits of doing so outweigh the costs. Perhaps unsurprisingly, expected profits from this “optimally owned” subsidiary, and hence the decision to invest, are likely to be affected by Proven Oil/Gas Reserves. In this scenario, the country-specific amount of reserves affects the selection regression (the decision to invest) and does not affect the ownership type preferred by the firm directly, i.e. Proven Oil/Gas Reserves may stimulate FDI but need not affect who finances the investment. Majority ownership by US parent company or by outside (e.g. by local) investors may be unaffected. This exclusion restriction identifies model (1)–(2). The nature of correlation: Importantly, it can be expected that ownership type Majority_Owned and investment decision Invest_Oil are not conditionally independent (i.e. \(\rho \ne 0\)). If firms that are more likely to invest also have systematic preferences towards majority or minority ownership, the unobserved heterogeneity in the ownership and in the selection equations are correlated, which means that censored ownership types are not missing randomly. Some of the correlated unobserved heterogeneity could stem from firm-specific capabilities and factors such as, for example, the prior experience of top management with internationalization strategies. Hence, we include firm indicator variables in \(x\) and \(z\) to control for unobserved heterogeneity at the firm level. Further unobserved heterogeneity might be present at the level of firm/country dyads. Clearly, this type of heterogeneity can neither be adequately corrected by firm-level variables, nor by firm indicators. Consistent and efficient estimates in such circumstances require models with selection correction that explicitly model \(\rho\ne 0\). Standard errors: We report cluster-robust standard errors clustered on countries that are appropriate when main explanatory variables of interest are both country-specific and persistent over time, as is in our case (Abadie et al. 2017; Cameron and Miller 2015). In alternative specifications, we also use standard errors clustered on firms. Firm-level clustering greatly inflates statistical significance of country-level variables while statistical inference of firm-level variables (i.e. firm size) does not change. We choose not to aggregate data at the country level as the investment and the ownership decisions are correlated at the firm level. Some important (unobserved) heterogeneity might be lost if the investment and the ownership regressions are, instead, analyzed at the country level. The dependent variable Invest_Oil in the selection regression (1) is defined for firm-country-year triads and is equal to one if the US firm owns an ownership stake in an Oil and Gas sector firm in the host country and zero otherwise (Table 1). The dependent variable Majority_Owned in the ownership regression (2) is observed only for the firms that choose to invest. It equals one if the firm owns a majority stake (50% or more) in (at least one) of the reported subsidiaries in the host country; and zero otherwise. Table 2 presents summary statistics on all variables used in the study. The final sample contains subsidiary ownership information for 250 US firms reported across 44 host countries. The sample consists of 53,803 firm-country-year triads. Sample firms report subsidiaries (at least one or more) in 2361 triads. The next six measures capture the threat and impact of armed conflict and unrest. “scores risks based on expert understanding of the political, economic, social, and security environment, using economic models, information from open sources, and structured intelligence gathered by a network of thousands of in-country personnel in-house expertise and models, [and] experts in the field and in-country sources with proven records of reliability” (IHS 2015). One of the benefits of the IHS data is that it is forward-looking (one year) and thus appropriate for forecasting the types of risk expected to influence investors. Civil war risk is the “risk of intra-state military conflict, in the form of an organized insurgency, separatist conflict, or full-blown civil war, in which rebels/insurgents attempt to overthrow the government, achieve independence, or at least heavily influence major government policies” (IHS 2015). Interstate War Risk: Drawing on the IHS dataset derived above, Interstate War Risk measures the “risk that the country will be subject to use of force by another state […] covering the spectrum from targeted military strikes against limited targets to full-scale war with the aim of changing the government and/or occupation” (IHS 2015). It ranges from 0 (no territorial or other disputes) to 10 (“ongoing interstate military conflict involving major ground/air operations, with the aim of changing the government or one will almost certainly erupt in the 1-year outlook”, IHS 2015). The following two variables are also taken from IHS. Terrorism Risk is the risk that “activities of any non-state armed group or individual cause (or are likely to cause) property damage and/or death/injury through violence” (IHS 2015) including organized crime. It ranges from 0.1–0.7 with no or little terrorism to 6.5–10 with “major attacks […] against buildings, transport, and public places […] most days as the state confronts numerous, well-armed, highly motivated and organized insurgents” (IHS 2015) with significant loss of life and property. Labor Strike Risk is the “risk that strikes cause damage to assets, business disruption, or injury” (IHS 2015) ranging from 0.1–0.7 with only occasional strike action with minimal disruption, to 6.5–10 with severe disruption, violence, and significant damage to facilities and infrastructure. Terrorism Events: The annual count of terrorism events, converted into rate per 1000 population. Unlike the IHS-derived variables, Terrorism Events is based on actual reported events and not based upon perception. We use this as an alternative measure of instability in robustness checks. These data are calculated from the National Consortium for the Study of Terrorism and Responses to Terrorism’s (2016) Global Terrorism Database (GTD) (2016). The GTD defines a terrorist attack as “the threatened or actual use of illegal force and violence by a non-state actor to attain a political, economic, religious, or social goal through fear, coercion, or intimidation”. The act must be intentional, involve violence or the immediate threat of violence, and the actor cannot be a state. Two of the following three criteria must be satisfied: a political or economic goal; an attempt to influence a wider audience; and “the action must be outside the context of legitimate warfare activities”. Battle Deaths: The annual count of battle deaths, converted into rate per 1000 population. Like terrorism events, this measure is based on actual reported statistics and not expert perception. These data are from the World Bank’s Open Data (2016) and capture all fatalities (including civilians) related to armed conflict. These deaths can result from acts of war and include, but is not limited to, guerrilla actions, bombings, and crossfire. Log Assets: We use the natural logarithm of the total assets of the parent firm (lagged by one year) as a proxy for technical/competitive advantage. The literature suggests that larger firms enjoy economies of scale and scope, benefit from a less restricted access to international capital markets, and are more likely to internationalize. 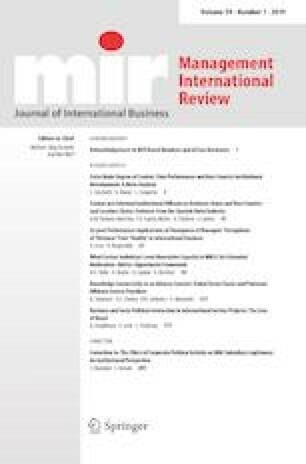 Larger firms are more likely to have prior experience with internationalization strategies and international trade, and benefit from brand name recognition (Bhaumik et al. 2010; Wang et al. 2012). Furthermore, larger firms have means to engage in defensive acquisitions in global markets in the game of ‘eat or be eaten’ (Gorton et al. 2009). Rule of Law: The World Bank Governance Indicator (WGI) measure, Rule of Law, is used to measure this phenomenon, highly correlated with other WGI measures (Knoll and Zloczysti 2012). Institutional development of various types is seen to be a significant determinant of FDI and development generally (Barry and Tacneng 2014; Javorcik and Wei 2009; Jensen 2003; Morrissey and Udomkerdmongkol 2012; Wellhausen 2015). WGI Rule of Law captures perceptions of “the quality of contract enforcement, property rights, the police, and the courts, as well as the likelihood of crime and violence” (Kaufmann and Kraay 2016; see also Knoll and Zloczysti 2012). GDPC: the log of host country’s GDP per capita (World Bank Development Indicators 2017). This measure is indicative of state capacity and level of development (Jensen 2004) and is commonly used as a control variable in FDI literature (Chakrabarti 2001). GDPC is highly correlated with Rule of Law measure and is used as an alternative control to Rule of Law in robustness checks. Democracy: the polity measure provides an annual measure of democracy on a 21-point scale from − 10 to 10 with 10 being the most ‘democratic’. These data are from the Polity IV dataset (Marshall and Gurr 2010) and “consists of six component measures that record key qualities of executive recruitment, constraints on executive authority and political competition. It also records changes in the institutionalized qualities of governing authority” (Center for Systematic Peace 2016). High-Tech Exports: The share of high-tech exports in the host country’s export (World Bank 2017). This variable controls for efficiency- or asset-seeking FDI that targets economies endowed with significant levels of intellectual and human capital. Proven Oil/Gas Reserves: For our tests, it is important to distinguish the attraction of resource endowments from country risks. These data are sourced from BP Statistical Review of World Economy (2014). We control for the amount of Oil and Gas resources in the host country and convert proved gas and oil reserves to Barrel of Oil Equivalent (BOE). The BOE is a unit based on the approximate energy released by burning one barrel of crude oil. We use the log of (BOE + 1) to allow for country/years that report zero reserves. The time series of proved reserves is lagged by 1 year in order to allow for a time lag in investing decisions. To the extent that reserves have an independent effect on US FDI and are correlated with main effects (e.g. Civil War Risk) and the host country’s institutional development as suggested by the ‘resource curse’ literature (e.g. Robinson et al. 2006), including this variable controls for potential omitted variable bias. We also note that underground Proven Oil/Gas Reserves that await extraction are not directly affected by the main variables of interest, i.e. by violence and political risks, nor they are affected by expectations of future violence. This means that including Proven Oil/Gas Reserves does not introduce a ‘post treatment bias’ with respect to the main variables of interest. This is in contrast to non-extractive industries, where the size of domestic market is often directly affected by (a threat of) conflict and violence. Inflation: Sound macro-economic policy and stable macro-economic indicators such as low levels of inflation could have a positive effect on FDI (for contrary evidence see Buckley et al. 2007). Distance from US: the log distance from the US to the host country (in km). We assume that investment is more likely close to the company base, supported by a literature that suggests distance may be associated with lower levels of cultural distance, as well as logistical issues (Campbell et al. 2012). OPEC: OPEC membership dummy (Yes/No). Results reported below are qualitatively robust to the exclusion of OPEC dummy from the regressions. Our findings support studies indicating US Oil and Gas FDI is attracted to countries offering ‘good’ governance institutions such as rule of law and democratic control (c.f. Bailey 2018). However, our focus is on the role of armed conflict and unrest and the possibility that firms may have developed capabilities to exploit both political stability and political risk in different environments. Turning to our two hypotheses based on ‘bad’ governance and real options theories: Models 1–6 (see Table 3) demonstrate ceteris paribus that all six types of political risk and violence (Interstate War Risk, Civil War Risk, Terrorism Risk, Terrorism Events, Battle Deaths, Labor Strike Risk) report positive point estimates in investment regressions (Invest_Oil). The effects of Civil War Risk, Terrorism Events, and Labor Strike Risk are strongly statistically significant and the effects of Terrorism Risk, and Battle Deaths are weakly significant, thus supporting H1. Corrected for selection bias, ownership regressions (Majority_Owned) show Civil War Risk, Terrorism Risk, and Labor Strike Risk, are positively and significantly associated with majority ownership. Terrorism Events is weakly positively associated with majority ownership. Hence, H2 is supported. The values of correlation coefficient \(\rho\) are mostly positive across models 1–6. Positive \(\rho\) values mean unobserved factors that increase the probability of a US firm being in the country also increase the probability of majority ownership. However, reported \(\rho\) values are not statistically significant. This suggests firm-level indicator variables provide a reasonable control for selection bias. While investment and ownership decisions are correlated at the firm level (\(\rho\) values are positive and significant if firm-level indicators are omitted), there seem to be no further correlation at the level of firm/country dyads. While both H1 and H2 are supported, the level of support is strongest for Civil War Risk, Terrorism Risk, Terrorism Events and Labor Strike Risk. Findings for Interstate War Risk are inconclusive. The latter result is discussed below. Turning to the control variables, FDI location decisions (Invest_Oil) are positively correlated with Log Assets, Rule of Law, Democracy, Proven Oil and Gas Reserves, High-Tech Exports, and negatively correlated with Distance from the US, and OPEC. These relationships have expected signs in agreement with prior studies. Ownership regressions (Majority_Owned) show that, once invested, Rule of Law and Democracy are positively associated with MNEs holding majority ownership stakes. We also report the controls-only model in Table 3 for comparison purposes. We proceed with robustness checks as follows. First, we perform a subgroup analysis for the subsample of large firms (top 50% of firms by total assets) to see if the reported effects associated with political risk and unrest are robust across the firms that are relatively more likely to invest. Table 4 reports the corresponding coefficients of the political risk variables for the subsample of large firms. The results for control variables are not reported for brevity. All regressions use the same set of control variables used in Table 3. The results show that both H1 and H2 are generally supported in the subsample of large firms with respect to Civil War Risk, Terrorism Risk, Terrorism Events and Labor Strike Risk. The weakest support is reported with respect to Interstate War Risk and Battle Deaths. Second, we use industry-level indicator variables instead of firm-level indicators to investigate a possible over-specification of the benchmark model reported in Table 3. The results, available from the authors upon request, are robust in this alternative specification. The inference with respect to H1 and H2 is unchanged. As we expect, when industry indicators are used, some uncontrolled firm-specific heterogeneity remains and it is picked up by the correlation coefficient levels \(\rho\) that are both higher than those reported in Table 3 and are strongly statistically significant. Next, we confirm the statistical inference with respect to H1 and H2 in alternative specifications where we use two alternative controls to Rule of Law–Control of Corruption (WGI measure) and, independently, the log of host country’s GDP per capita (GDPC). It has been suggested that host countries with high levels of corruption could confer higher levels of first-mover advantage to selected MNEs (Frynas et al. 2006). Both H1 and H2 are supported in these robustness tests, while Control of Corruption and GDP per capita are positively and significantly correlated both with FDI presence and with majority ownership. We also confirm our results in a setting where we drop Democracy control. These results are available from the authors upon request. We investigate FDI location decisions in Oil and Gas made by 250 US Oil and Gas firms across 44 countries, 2007–2013. In this final section we draw conclusions for theory, business practice and policy, and recognize the limitations of our study. FDI and high levels of MNE ownership in foreign subsidiaries (including Oil and Gas) are generally attracted to countries with stronger institutions and stronger rule of law but at the same time, civil war risk, terrorism risk, and terrorism events are also positively associated with Oil and Gas FDI. We note the importance of non-lootable resource investments and also demonstrate that intra and inter-state war have different effects, with some political instability and intra-state war positively associated with Oil and Gas FDI, while inter-state war risk is not statistically significant. This paper makes a contribution to the IB literature by developing theoretical explanations for this counter-intuitive phenomenon both in terms of real options for resource-extractive based firms, and reasons why even predatory states may not find it easy to expropriate the assets of foreign extractive firms. Foreign firms may identify valuable growth option opportunities for FDI in circumstances where states find it difficult to expropriate their assets. Therefore, entrepreneurial Oil and Gas firms with ambidextrous strategies may be willing to invest either in countries where states are constrained by ‘good’ governance (rule of law, democracy), or alternatively in where state interference is inhibited by state instability, incapacity and resource non-lootability. In this way, certain firms may be able to exploit each governance category to their advantage. The only risk variable that does not exhibit a positive relation with inward FDI is interstate war risk. It would appear that the threat of interstate war does change the FDI/country risk relation since it introduces the possibility of the takeover of national institutions by another hostile state that may already have its own sources of revenue and a disregard for non-lootability and expropriation. With this threat, some MNEs may exercise their hold-off options and reduce FDI and our failure to detect the average effects of interstate war risk could mask the underlying heterogeneity in MNEs’ responses. Of course, further contextualization of statistical models with more detailed conflict-related characteristics could yield more refined findings. In addition to developing this counter-intuitive view of the influence of political instability on inward FDI in a single, though important, industry, we also suggest a new perspective on first-mover advantages. Thus, far, it has been suggested that first-mover advantages for firms investing in high-risk environments, e.g. host countries with relatively high levels of corruption, have been secured by firms establishing early close relations with host governments (Frynas et al. 2006). In the case of Oil and Gas, however, it is argued that the majority of assets are relatively non-lootable and therefore less susceptible to corruption among state officials. Furthermore, our empirical focus on US firms means that the activities of Oil and Gas subsidiaries are more likely to face criticism or questioning from home country institutions and stakeholders regarding unethical behavior (Driffield et al. 2013). In this context, first-mover advantages are less likely to be secured through close ties with host governments, but may instead be secured by early FDI in energy reserves that host country governments are incapable of exploiting on their own, conferring growth options on Oil and Gas subsidiaries. Real option theory, therefore, gives quite a distinctive perspective on first-mover advantages. We do not suggest that this perspective is universally applicable, though it may apply to other resource-extractive industries besides Oil and Gas. Besides FDI presence, the results also support H2 in that higher subsidiary ownership levels are positively associated with conflict risks, again consistent with the possibility that ‘bad' governance may promote overseas investment in Oil and Gas. While the rule of law and other institutions can constrain a state from expropriating assets, so can instability, conflict and incapacity. If the results reported here are reproduced for other extractive industries, it may suggest a need for bespoke FDI theories for this sector based on corporate governance and real option theorizing. Academics risk accusations of impertinence when they dare to offer advice for practitioners, especially when they have simply observed the investment patterns of entrepreneurial firms actually operating in environments that are extremely unstable and risky. Nevertheless, it may be useful for practitioners to be aware of the bigger picture, e.g. other extractive firms may learn from the experiences of Oil and Gas. The asset portfolios of firms in these industries and their growth options may mean that a search for ‘good’ governance institutions may be disregarded in favor of an entrepreneurial perception of conflict risks as opportunities as well as threats. Retaining a high proportion of MNE ownership in foreign ventures in these circumstances may prove to be the best way to accommodate the risks associated in arms-length market transactions. Oil and Gas was explicitly chosen for this study as an outlier industry most likely to demonstrate the attraction of FDI to unstable environments. The task for future research may be to investigate whether conclusions developed from US Oil and Gas firms may be extended to other extractive industries.3 It may also be possible to investigate why interstate conflict has no significant impact on inward FDI. Our findings may also have policy implications. First, the ‘good’ governance agenda being pushed by various international agencies (Goldfinch et al. 2013) does seem to be consistent with its positive association with FDI. At the same time, policymakers may not need to be concerned with ‘bad’ governance when firms seem perfectly capable of handling it themselves. Of course, the ‘bad’ governance option may be profitable but perhaps ethically dubious. Nevertheless, the instability and incapacity of otherwise unconstrained states, and perhaps even their ethical lapses, might provide upside opportunities for investment; as well as risks. According to a former US Vice President, Halliburton CEO and famous oilman Cheney (1998, n.p.). “The good Lord didn’t see fit to put oil and gas only where there are democratically elected regimes friendly to the United States. Occasionally we have to operate in places where, all considered, one would not normally choose to go. But we go where the business is”. A natural suspicion may exist that firms taking advantage of the opportunities generated by incapacity, instability and conflict may also contribute to factors that maintain (and perhaps even facilitate) it, but there is little evidence to support this (Demir 2016). Our study has limitations. First, while the dataset we use is large, it only includes American Oil and Gas MNEs. While the theoretical purpose of a focus on this single industry has been explained, it is also possible that boundary conditions apply to effects found only in relation to US firms. Indeed, a growing body of research notes the importance of cultural distance and colonial heritage in investment decisions. For example, MNEs from home countries with high levels of corruption and weak rule of law may invest and thrive in host countries with similar characteristics (Driffield et al. 2013; Godinez and Liu 2015). However, our study focuses solely on firms from a relatively low-corruption environment in the USA. A comparative study that included European and Chinese firms could be illuminating. While this paper investigates the financial years 2007–2013, characterized by record high oil price levels and financial market turmoil and instability in the wake of the 2008 financial crisis, the relatively recent period 2014–208 has seen oil prices testing 13-year lows (before recovering) as technologically superior MNEs have been developing and perfecting new and effective extraction methods (e.g. ‘fracking’, horizontal drilling). Whether this combination of relatively lower oil prices and new and cheaper extraction technology has made MNEs more (or less) willing to cope with political risks could be a focus of further empirical work. Another possible limitation is that, due to data limitations, we look at location presence only and do not analyze the value of the investments. Another interesting line of enquiry could be to compare and contrast entry and exit decisions in more detail, particularly in the context of state instability. While our analysis explicitly controls for the country-specific amount of Oil and Gas resources, the data on the relative quality of the resource, the depth of the oil fields and the associated cost of extraction per unit are unavailable to us. If the relative quality of the resource and the depth and accessibility of oil deposits is correlated with conflict and violence, this data would have to be included in future research. Furthermore, any differences between the FDI responses of small, large and giant US Oil and Gas could be teased out by longitudinal studies covering more time and fewer firms. Finally, we have not looked at firm performance issues in depth. To what degree do the relationships we look at—particularly firm size, technological sophistication, and their relationship to forms of state instability—affect performance? This study, while reconciling some key ambiguities in the existing literature, also suggests novel ways in which FDI studies could be extended. A real option is defined as “a right, but not an obligation, to take some future specified action at a specified cost. At its core is a fundamental decision asymmetry to take a future decision (e.g., invest) only if it’s beneficial to the decision maker, but not otherwise” (Trigeorgis and Reuer 2017, p. 43). This model is implemented in STATA with the heckprobit command (Van de Ven and Van Pragg 1981). E.g., mining giant Freeport-McMoRan in Papua, Indonesia, spent $28 million on private security in 2010 (Montlake 2012). Center for Systematic Peace. (2016). Polity Project. Available at http://www.systemicpeace.org/index.html. Accessed 12 Apr 2017. Cheney, R. (1998). Defending liberty in a global economy. Paper delivered at the Collateral Damage Conference. https://www.cato.org/publications/speeches/defending-liberty-global-economy. IHS (2015). IHS Country Risk Methodology. Available at https://ihsmarkit.com/products/country-risk-analysis-forecasting.html. Kaufmann, D., & Kraay, A. (2016). World governance indicators. http://info.worldbank.org/governance/wgi/#home. Accessed 02 June 2017. Marshall, M. G., & Gurr, T. R. (2010). Polity IV Project: Political regime characteristics and transitions, pp. 1800–2010. http://systemicpeace.org/polity/polity4.htm. Accessed 04 May 2017. Montlake, S. (2012). Freeport-McMoRan in Papua, Forbes Feb 1. https://www.forbes.com/global/2012/0213/feature-indonesia-freeport-mcmoran-back-fill.html#77b5c8747576. Accessed 13 Nov 2018. National Consortium for the Study of Terrorism and Responses to Terrorism (START). (2016). Global Terrorism Database [Data file]. https://www.start.umd.edu/gtd. Accessed 24 July 2017. World Bank. (2017). World Bank development indicators. http://data.worldbank.org/data-catalog/world-development-indicators. Accessed 12 Apr 2017.